* But it hasn't always been that way. Hello everyone and welcome to the organic gardener - my first proper website. You're probably here to find out more about me (the author of this website). Or perhaps you want to know why you found my website in the first place and how it works for me. Or you may want to know a bit about my real organic garden, how it came to be, and where it's going. Well thanks for dropping by. Because I'm just about ready to share with you some of the joys and freedoms of my organic gardening life and business. More about my gardening history. A Web Site That Works? My father was a gardener and a well-read gentleman. I was fortunate enough to go to college and graduate in botany. My working class parents were proud of me, and although they did everything they could for me I've since come to realise the importance of those missing ingredients. They are described nowadays under the term 'social mobility' - in short the ability to break through the class barrier and make an education count. I never beleived it was about 'who you know'. Living in the biggest unemployment black spot in the country didn't help either. 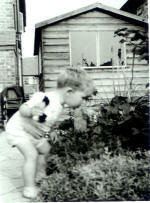 Gardening has always been one of the lowest paid jobs and I didn't possess the confidence to move far. So although I believed that I could do lots more, at that time the Internet didn't exist and pocket calculators had only just arrived. I knew I could do much, much, better. But I was pursuing the every day accepted paths into a job, training, applying for advertised posts, etc... etc... The job I really wanted, was in writing. That was the undiscovered country. Needless to say I can't seem to get away from gardening partly because I really enjoy it. So if you want to build a lively organic garden that you can eat, taste and smell, do contact me. You know, whatever you do, the experience can often be put to use later. And my unlikely experiences had ranged from typing, admin and office training, and a few I.T. jobs to park ranger, copywriting, care work and gardening... ... In the long run it's all proved to be useful. And my current work right here is Me! Who knows what tomorrow will bring? Make no mistake, to reach my goals I have stiff challenges ahead of me, but now at last I'm getting the rewards I deserve. So let me tell you more about that and how the organic gardener made it onto your screen - see below. Copper Beech and Golden Privet hedges were planted down both sides along with a Rosemary hedge. One of the earliest pattern imprinted concrete paths was laid out straight and level. Beyond the washing line Dad grew fruit and vegetables in north south rows. In those days he grew his tomatoes in 2-tier cloches and there was a chemical for everything in gardening. I shudder to think of it. The greenhouse was built in the middle of the garden. Only a remnant now remained of the long bed of flowers. They hadn't been eaten by pests, but by a concrete path for me to play on, then a concrete shed to join the small wooden shed. Later a garage was added. And later Mum and I found ourselves living alone. Over many years my garden vision began to take shape. In this temperate climate Mediterranean gardens with exotic flowers were not for me. I wanted to create some natural habitat. I wanted to thread flowers through the vegetable and fruit gardens so as to blur the unnatural looking separation. I wanted to open out the aspect from the house. And I was planning a somewhat esoteric design with geological features to remind me of the mountains and moreland that I loved. The fruit trees with grafted on branches had already gone because I hadn't realised how to manage them with the hedge so close. I decided that the remaining shed and greenhouse had to go too. I sold them and built new ones at the bottom of the garden where they shelter each other and everything is at hand. I realised that the straight sided hedge, paths and walls would be a problem, and I worked out various designs to reduce their impact and create the feeling of an open distant view within a relatively small garden. Part of the garden had been left in a holding pattern with established weedy vegetation. But after Mum died I was ready to grow enough food to live on and make my cooking and eating very special. Over some years I had looked after Mum at home and it became impossible for me to go out to work. But I knew there must be an opportunity on the Internet for me to work from home. My search brought up several opportunities - from franchises that cost thousands along with hard work limited by 24 hour days, to cheap pyramid selling scams like the cash machine that is useless and ethically wrong. But here's a warning for time wasters. Since I joined SiteBuildIt, article marketing has become popular. If I were searching today I would probably waste my time by going for that instead. However, my real experience with SiteBuildIt tells me that article marketing would have been a complete waste of effort. the-organic-gardener.com - A Website That Works! 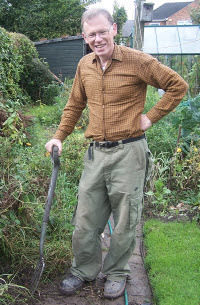 You are probably reading the organic gardener today because my pages came up on a search listing or you have been recommended by a friend or link from another website. But you won't have clicked any paid adverts to my website. Of course I also like to think that you may have bookmarked the organic gardener and return to it regularly because you enjoy the content. However, none of this would have been possible for me to do, and you would never have seen the organic gardener, without the help of SiteBuildIt. Indeed I can even claim that it works despite my own incompetence in producing it - which is sometimes quite worrying! But should you decide to try out SiteBuildIt for yourself with its money back guarantee, I have one word of advice first. Follow the advice that SBI gives you (all the tools you need are included). This non technical advice has been essential to the organic gardener. It is a sure route to success for any business website or able enough individual like me - and because you are reading this - no doubt like you too. The result is that I can now live freely paying the bills with no need to apply for outside work, and I can spend time in my garden. I have a wonderful combination of choice and fulfilment. People often ask me what I sell and I have to tell them that I don't sell anything. No advertising, no postage and packing, no warehousing, no guarantees or insurance. Of course the trusted partners that I link to deal with all that for you, so I suppose I really kind of work for them. However, if I were planning to sell products and services I would be able to bring my customers from further afield who are willing to pay more. That's what trusted SBI insiders are claiming. forwarded my script to publishers many times and still be disappointed by rejections. A website is different because I have the opportunity to provide up-to-date current information to you. But also because I get the opportunity to earn some returns before it's finished. Furthermore I can analyse feedback and change the content to reflect both current issues, new developments and the way it is being received by my visitors. It's exciting work that gives me control of content, style, and online publishing.